The full text of the agreement signed in Minsk on Thursday, February 12. This text was translated into English by UNIAN from a text posted online by the Kremlin. It is not an official translation. Editing clarifications in the text appear in square brackets. 1. An immediate and comprehensive ceasefire in individual areas of the Donetsk and Luhansk regions of Ukraine and its strict implementation starting at 0000 (Kyiv time) February 15, 2015. Withdrawal of aforementioned heavy weapons shall begin no later than the second day of the ceasefire and end within 14 days. The OSCE will contribute to this process with the support of the Trilateral Contact Group. 3. Starting the first day of such withdrawal, ensuring the effective monitoring and verification by the OSCE of the ceasefire and the withdrawal of heavy weapons with the use of all necessary technical means, including satellites, UAVs, radar systems, etc. 4. 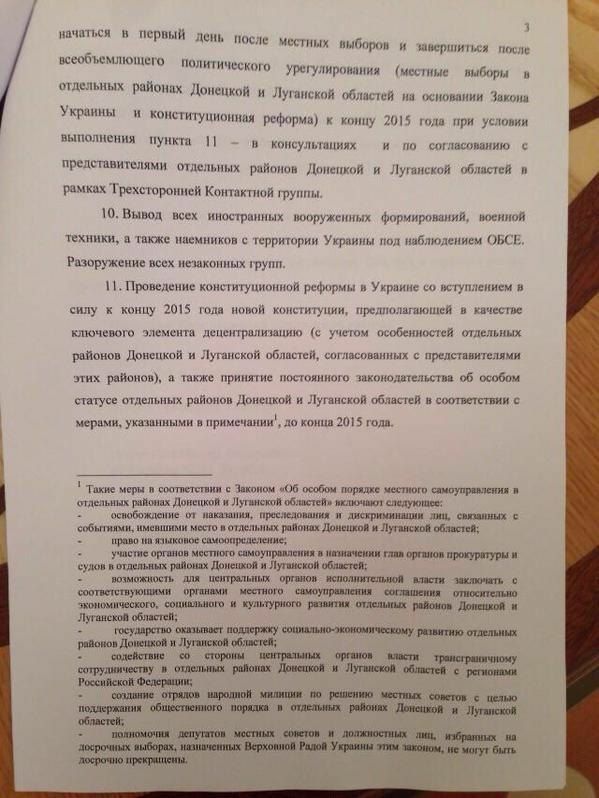 On the first day after the withdrawal, to begin a dialogue on the procedures for holding local elections in accordance with Ukrainian law and the Law of Ukraine "On a temporary order of local government in individual areas of the Donetsk and Luhansk regions," as well as on the future regime of these areas, according to this Act. 5. To provide pardons and amnesties by the enactment of a law prohibiting prosecution and punishment of persons with regard to the events that took place in individual areas of the Donetsk and Luhansk regions of Ukraine. 6. To ensure the release and exchange of hostages and illegally detained persons based on the principle of "all for all". This process must be completed no later than the fifth day after the withdrawal. 7. To provide secure access, delivery, storage and distribution of humanitarian aid to the needy on the basis of an international mechanism. 8. Determination of the procedure for the full restoration of the socio-economic relations, including transactions of social payments, such as pensions and other payments (takings and income, timely payment of all utility bills, renewal of taxation within Ukraine’s legal framework). To this end, Ukraine shall regain control over the segment of its banking system in conflict-affected areas, and an international mechanism to facilitate such transfers will probably be created. 9. Restoration of full control over the state border of Ukraine by Ukraine’s government throughout the whole conflict area, which should begin on the first day after the local elections and be completed after a comprehensive political settlement (local elections in individual areas of the Donetsk and Luhansk regions on the basis of the Law of Ukraine, and a constitutional reform) by the end of 2015, on condition of implementation of paragraph 11 - with consultations and in agreement with the representatives of individual areas of the Donetsk and Luhansk regions in the framework of the Trilateral Contact Group. 10. The withdrawal of all foreign armed forces, military equipment, as well as mercenaries from the territory of Ukraine under the supervision of the OSCE. Disarmament of all illegal groups. 12. On the basis of the Law of Ukraine “On temporary order of local government in individual areas of Donetsk and Luhansk regions” the questions regarding local elections shall be discussed and agreed with the individual areas of the Donetsk and Luhansk regions in the framework of the Trilateral Contact Group. Elections will be held in compliance with the relevant standards of the OSCE with the monitoring by the OSCE ODIHR. 13. To intensify the activities of the Trilateral Contact Group, including through the establishment of working groups to implement the relevant aspects of the Minsk Agreement. They will reflect the composition of the Trilateral Contact Group. - The powers of local council deputies and other officials elected in snap elections, appointed by the Verkhovna Rada of Ukraine according to this law, cannot be terminated.